A few Summer accents around your home give you the flavours of Summer, without ever leaving your front doorstep. Give your home a Beach House refresh over Summer with this blue marle cushion in soft cotton. For a limited time, you'll receive this pattern leaflet free with your order when you make any purchase! (RRP $4.95). If you'd like to get the yarn for this pattern, you'll need just 3 large balls of Debbie Bliss Denim DK, with enough remnants to craft accents on any further cotton projects you're working on. 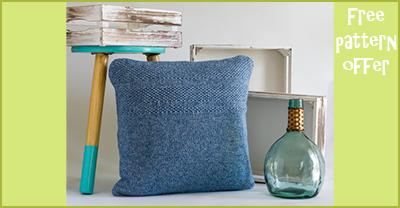 Note: our cushion is knitted in Debbie Bliss Denim DK (Shade True Blue).